All over the country last night, Americans turned on their televisions to tune in to the first of three Presidential Debates. Quinnipiac’s Student Government Association gave students an opportunity to gather together at a debate watch party at Rocky Top Student Center last night for a live showing. Vice President of Programming, Lauren Enea, said that the notion for the debate watch party began as part of a SGA Executive Board discussion this past summer. “We wanted to put elections and understanding our government not only as a focus on our internal student government but also on the student body as a whole,” Enea said. Professor of political science Scott McLean kicked off the event by giving the audience some historical background on the nature of these debates, and then showing highlights of infamous and memorable moments in the history of presidential debates. The presidential candidates were first asked what the major differences were between the two candidates as to how each one would go about creating new jobs. President Barack Obama and Governor Mitt Romney discussed their proposals for future economic growth and how to reform the tax code for much of the debate. Romney emphasized protecting small businesses and the need to allow for economic growth without government interference, while Obama focused investing in clean energy and education to create new jobs and grow the economy. “What we’re seeing right now is a trickle-down government approach, which has government thinking it can do a better job than free people pursuing their dreams. And it’s not working,” Romney said. Obama delivered a counterpoint later in the debate, when the topic had shifted slightly to the fundamental question of what role government should play in the lives of American citizens. Overall, Romney was the more energized of the two candidates, while Obama gave a complacent performance. Romney often looked directly at his opponent with a confident grin, while Obama appeared tired and as if he did not want to be there. Despite Romney’s strong performance, McLean said he thought the debate results could give Obama the advantage. He said that the debate would not be the ultimate factor swaying undecided voters to one candidate or the other. Directly after the debate, many commentators and pundits concluded that Romney had won the debate, citing his strong performance and the fact that Obama was not quite aggressive enough. However, it is unclear if this debate win for Romney will cause any significant shift in the polls of key battleground states such as Ohio, Iowa, Wisconsin and Virginia, where the president has been leading by margins ranging from four to 11 points. Freshman Allison Beckman said she was paying the most attention to education policy because that is what affects her the most on a personal level. She said the president was compassionate and reassuring on this topic while Romney seemed out of touch. 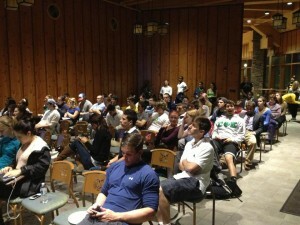 SGA representatives were pleased with the turnout with more than 75 people gathered at Rocky Top for the watch party. The next watch party to watch the Vice Presidential Debate will also be sponsored by SGA, and will take place on Oct. 11 in the new piazza space in the Carl Hansen Student Center on the Mount Carmel Campus.